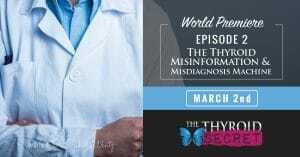 The second episode of The Thyroid Secret is titled “Thyroid Misinformation and Misdiagnosis Machine”. 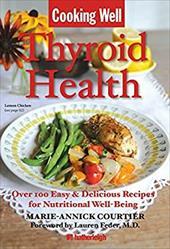 In it, they discuss the myths and misdiagnoses that surround Hashimoto’s and thyroid disorders in general. I’ll try my best to summarize it below. Genetic predisposition. You don’t have the disease, but are predisposed to developing it. Development of autoimmune reactivity to our own thyroid gland. Our thyroid begins to be attacked by our immune system and we start to develop symptoms. Subclinical changes. We start to see changes to lab markers and more symptoms. Progression to other autoimmune conditions. Most people with Hashimoto’s aren’t diagnosed until they’re in the fourth or fifth stage, when symptoms are really evident. So, they usually don’t even start treatment until then as well. And, of course, conventional medicine only treats the symptoms and doesn’t prevent progression of the disease to the fifth stage. Hardly anyone questions why conventional medicine is quick to destroy or remove the thyroid as part of treatment instead of treating the root cause. Many patients are not told about the autoimmune factors of their disease either. Many of you know from personal experience that when your Hashimoto’s flares up (when the body is attacking itself), things go haywire. You’re suddenly “allergic” to many different things you didn’t have a reaction to before. The problem is, if you don’t treat the root cause of your disease, you can’t promote true healing. The attack against your body will continue. This can lead to other conditions including vision problems, balance problems, alopecia, psoriasis, eczema, Crohn’s, etc. Throughout this episode, patients discuss their symptoms and struggles, from fatigue to depression. Many of them were misdiagnosed and prescribed anti-depressants or other medications that didn’t help their condition. They were told it was all in their heads. They were told their lab results were “normal”. Well, you can have normal TSH and still not have your hormones be normal. Doctors should running labs for not just TSH, but for Free T3, Free T4, and Reverse T3 to get a whole picture of what’s going on. It can be devastating when thyroid misinformation and misdiagnosis keep patients suffering instead of healing. Nearly 80% of people diagnosed as bipolar have Hashimoto’s and when properly treated, symptoms go away. It’s tragic how many issues related to mental health could be prevented when the cause is hypothyroidism. Personally, my doctor told me he suspected I was bipolar. I told him I never had manic episodes. I insisted it was my thyroid. He gave me medication that not only didn’t work, but compounded my problems. When he finally properly treated my thyroid, my issues went away. Near the end of the episode, there was a discussion on how a change in diet can help with Hashimoto’s issues. Grass fed red meat can help with anxiety. Protein for breakfast can help sugar levels. Getting off gluten, as well as taking Zinc, can help with anxiety too. The episode ended by discussing how Hashimoto’s antibodies can be found in the brain. They can cause ataxia and Hashimoto’s Encephalopathy, a rare neurological condition associated with Hashimoto’s. Again, changing your diet can help with this as well as treating the root cause. I really related to the patient interviews in “Thyroid Misinformation and Misdiagnosis” and I’m sure you will too. I really got a lot of good information out of this episode.